Nature, reason and mortality are themes explored by Shakespeare’s bleakest tragedy, played out tonight at The People's Theatre on a bare brick stage populated by beggars and scraps of rubbish. 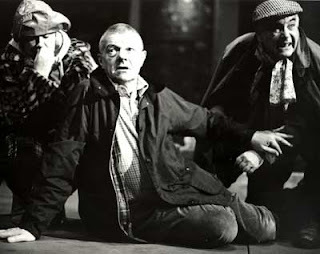 Tony Childs gave a powerhouse performance as Lear, perhaps more convincing as the distraught madman of later scenes than as the blustering monarch at the beginning of the play, but was consistently engaging and line-perfect. One of the best performances came from Sam Hinton, who was clearly enjoying himself immensely as the thoroughly villainous Edmund, savouring his monologues as if they were rare delicacies. Sarah Scott and Rye Mattick acquitted themselves well as the scheming Regan and Goneril, cackling and strutting the stage like analogues of Disney’s Maleficent. Some unfortunate technical glitches affected tonight’s performance, and elsewhere some of the dialogue was a little lost. However, this was compensated for by a committed and well coordinated performance by the ensemble cast. I did wonder if the modern dinner dress and Joanne Kelly’s female (wise) Fool were intended as a statement on contemporary patriarchal society; the People’s production of Lear, like the best Shakespeare, is the beginning of a discussion.